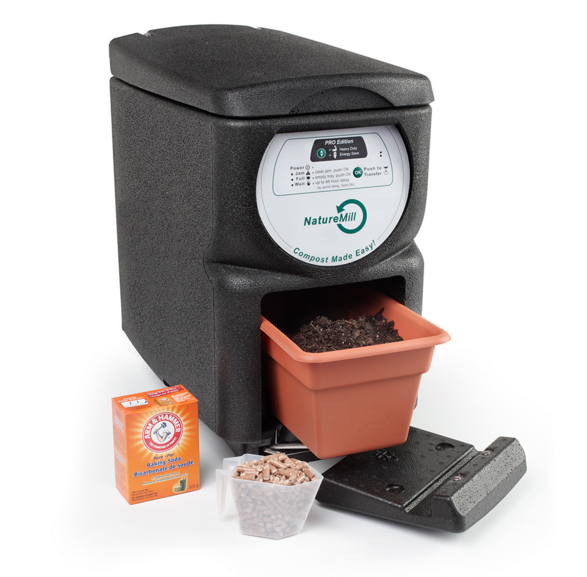 I have been trying to decide what compost unit to buy for the last several months. We don’t have tons of room in our backyard, and I wasn’t sure how big of a composter I should buy do to our large family. This past weekend I visited the Museum of Science and Industry’s Smart Home Exhibit (see: msichicago.org) and was amazed at this great kitchen countertop composter they had on display. When the tour guide said it takes 10 days to break down the compost and you can include meat, dairy, paper, and pet waste – I was sold!! Plus the unit looks nice, added bonus. Add up to 5lbs a day, it provides the “hot composting” conditions: mixing, air flow, heat, and moisture using only 5watts of energy or $0.50 per month. The energy released destroys odors, pathogens, and seed germination. The compost is later transferred through a trap door to the lower cure tray chamber, where it continues to compost while you add fresh waste items to the upper chamber. Provides home gardeners with a source of rich, organic fertilizer. I am feeling more and more confident that within the next year, we should be able to reduce our garbage (for a family of 6) to less than 1/4 of a 32 gallon can per week. So we could potentially go a whole month with only 1 can. At $3 per can for disposal, that is at least $100 garbage savings per year from our current spending. Not to mention the cost savings on not having to purchase top soil anymore!! Win Win…for my family and the planet. If you get one let me know!! I’m interested to hear how much trash reduction people experience. This is cool for kids to witness as well. My son is stoked about recycling and composting. Note: Sun Chips is expected to put out a compostable chip bag for next year. Excellent, eat chips then compost the bag. Much better plan than our current system. If you know of other companies doing biodegradable packaging, please post.